It is a shame to see such wonderful homes like "Fairview" be torn down for "improvements". They are gone forever. Thanks for the comment, Brad. It's often hard to get people to see the cumulative effect of tearing down all of these houses. They are a non-renewable resource, both in terms of the materials/design as well as the historical significance. Just wondering...Was the first house in the first photo moved closer to the old factory when the new house was built? In the third photo that has both houses and both factories in it, the old house seems much closer to the old factory. The little shed out back of the old factory in the first picture seems to be in front of the old factory in the later photos..
would anyone know where i might find old photos from lexington kentucky? would the duke archive also have photos from all their other locations? i just acquired one of their old buildings and would like to find any old photos of how it looked originally. 1211manchester dot com is where i can be contacted. thank you in advance for any help. Does anyone have any photos of the interior of the building while it was in use (or soon afterwards)? With the renovation happening now, it would make for a good comparison. The site just to the west of the first Duke Factory was Washington Duke's first in-town home. In 1884, Duke built a new brick factory, just to the east of his house and original factory. In 1888, he built a new house, which he called Fairview. Looking west, with the old factory building to the right. The steeple of Main Street Methodist Church is just visible above the roof of Fairview. And soon after, his new factory. 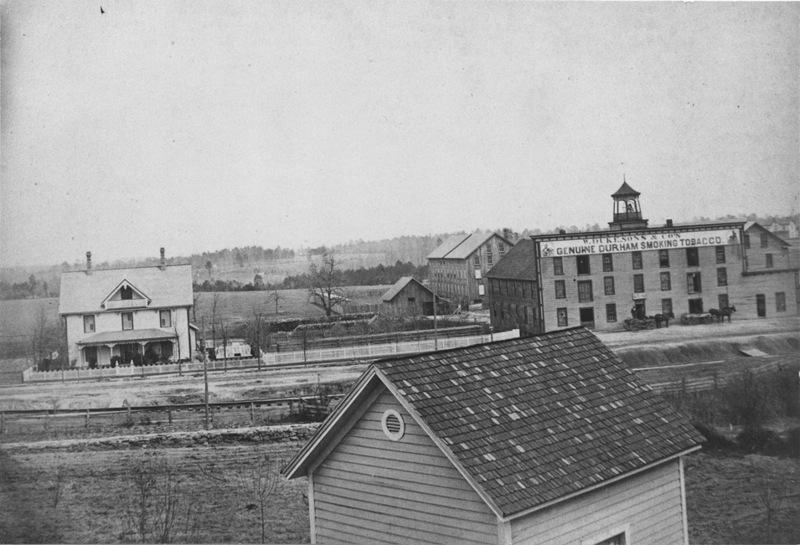 The view from the Southgate Jones property, looking northwest at Fairview, the old house, the old factory, and the new factory. Soon thereafter, the older house (and factory) were torn down. Facing Northeast, from Peabody and Duke Sts. And a closer view of the house, from Peabody looking north. 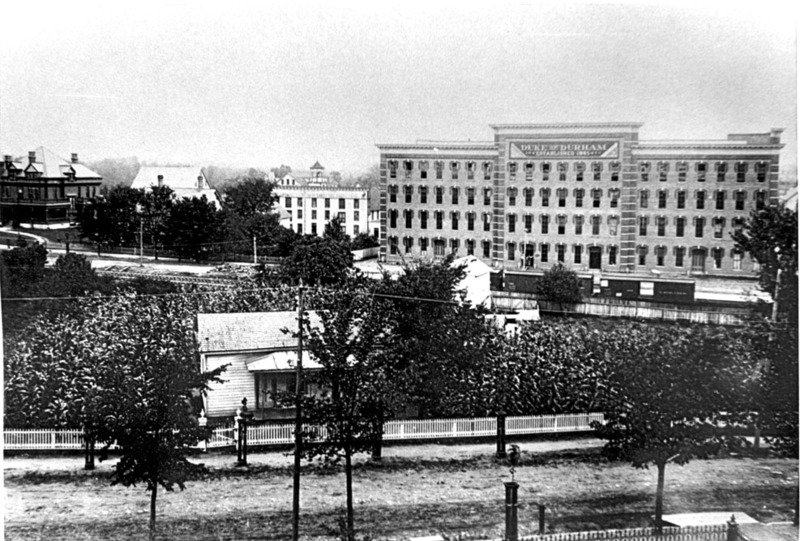 Sometime in the early 20th century, Fairview was torn down, and the L&M offices were built on site. This view is looking southeast, with the offices in the one story building to the right. This aerial shot shows the offices just to the west (left edge of frame) of the main factory building. Before construction of the New Cigarette Factory, L&M moved the office building across Main Street. For a brief period, the future site of the New Cigarette Factory served as a parking lot. 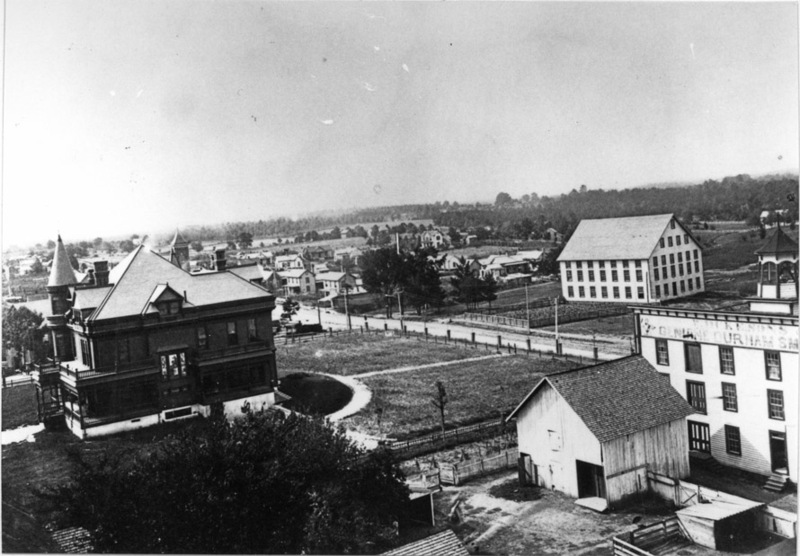 Shot from the Durham Ice Cream company building, looking southeast towards the intersection of Duke and Main Streets. The former entry stair to Fairview is visible at the corner - 1947. The Old Cigarette Factory from the site/parking lot, prior to decapitation - looking east - 1947. 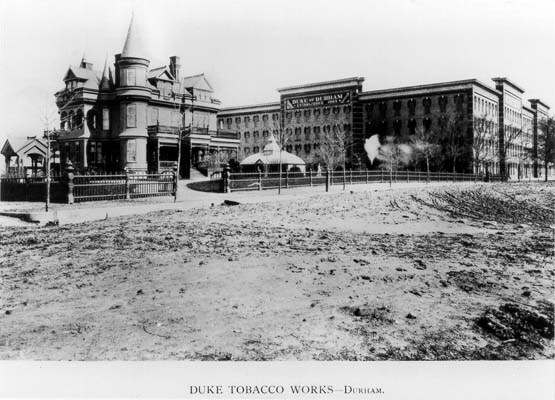 Ground was then broken on the New Cigarette Factory; the office building is visible on the other (north) side of West Main St.
A view of the building under construction. The current Brightleaf area is in the background, with Main Street Methodist Church and other businesses in view on the site of the Brightleaf parking lot. This view shows the completed New Cigarette Factory. 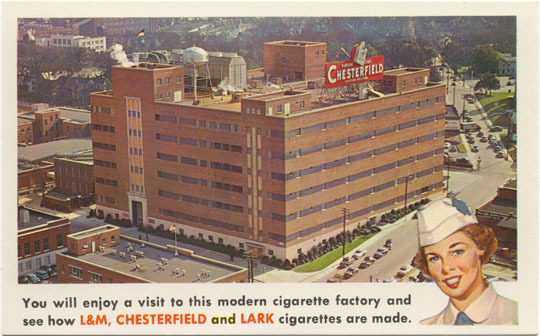 The factory building hosted tours for the general public; numerous promotional postcards were produced, featuring the New Cigarette Factory. An aerial view of the building for a postcard, looking southeast. Production of cigarettes dwindled towards the end of the 20th century. I'm not sure when production actually ceased at the New Cigarette Factory, but it was fairly moribund by the 1990s, and Liggett left for good in 2000. While the building has, to my aesthetic, a certain brutal and unforgiving utilitarian bulk, this was somehow mitigated by the iconic Chesterfield sign that sat atop the building, facing west. The bright red sign with three-dimensional cigarette pack, welcoming visitors, went a long way to cheering the face of the dour structure. Unfortunately, this was replaced in the mid-1980s with the corporate and utterly soulless black billboard with the Liggett and Myers name and logo. The fate of this building was in the balance for awhile, but the Blue Devil Ventures folks decided to keep the building and develop it as residential space. The plan has been to cut a 'light shaft' down the center of the building to create a courtyard/open space in the center and open up some more window space on the sides. My understanding is that, in the 'divorce' between partners in Blue Devil Ventures, custody of the New Cigarette Factory (known to the partnership as 'West Village Phase III') went to now-former partner Tom Niemann. If they could put back the big red and white Chesterfield sign, I think that would be fantastic. In early 2009, the city (with an assist provided by some Federal funding) moved towards improving the streetscape between the loop and Duke Street - giving the streetscape much the same treatment provided to in-loop sidewalks, utilities, etc. In 2015, Wexford began renovations of the building to house new office / biotech space. Wexford pursued the path that many previous suitors had charted; breaking up the massive floorplate by cutting an atrium into the middle of the building - i.e. turning the floorplate into a squared doughnut. Thanks for the comment, Brad.